30 night trial. Love it or get a full refund! You Won't Lose Sleep Over This Purchase... It Has a Money Back Guarantee! How's Your Relationship With Your Pillow? You spend 1/3 of your life with your pillow. That's an important relationship! Are you happy with the sleep your current pillow is giving you? 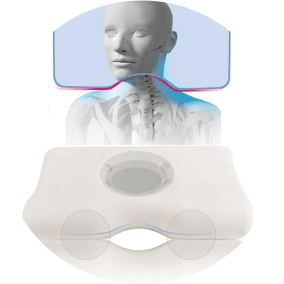 Unique 40 degree angle provides support and relieves neck and shoulder tension. improve blood circulation for better sleep. 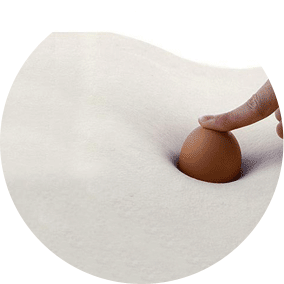 High density memory foam pillow provides optimum support and tension relief. 40 degree angle gives your neck the support it's been craving! 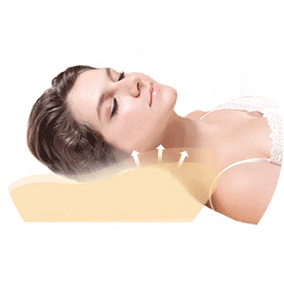 The elevation follows the natural curve of the neck and cervical joint. Positioning the neck high and the head low supported by high density memory foam allows the upper spine to rest in the ideal physiological shape. So if you sleep on your back, the AiSleep Memory Foam Pillow will relieve muscle fatigue and aches. Two-way curve draws out the tension in your spine and neck. Do you collect stress in your neck and shoulders? 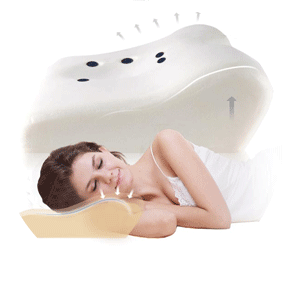 Look how the AiSleep Therapeutic Pillow repositions your neck and upper spine when you sleep on your side. Correct sleeping posture helps draw out stress and fatigue. And with your head correctly supported, muscles can relax, blood flows better, and sleep comes easier. If snoring or sleep apnea is problem, a better pillow can restore peaceful nights and well-rested mornings. 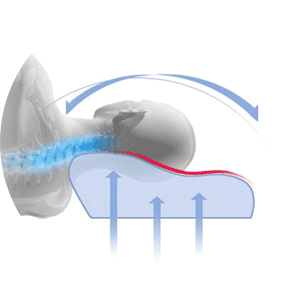 The unique butterfly shape of the AiSleep pillow supports your head and neck so you can breathe more freely whether you sleep on your back or side. The 3 cm hollow in the center cradles your ear. The contour of the foam edge ensures your head, neck and spine are in perfect alignment. And the elevation prevents pressure and arm numbness caused by sleeping on your side. Bio-magnets inside the pillow stimulate blood circulation, enhance sleep quality. Ordinary memory foam pillows don't have them. 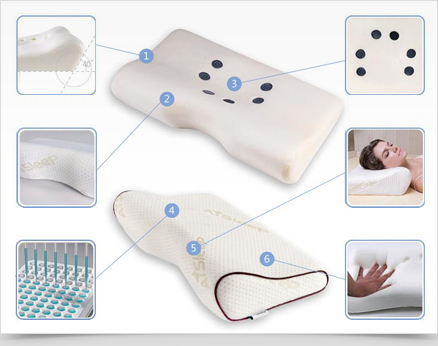 Only the AiSleep Therapeutic Pillow contains six bio-magnets strategically placed at acupoints around the neck. The natural, healthful magnetic effect aids in blood circulation, deeper sleep and relief from insomnia. 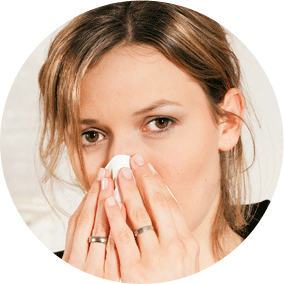 Small, strategically placed air holes also make the pillow breathable to help prevent bacteria. AiSleep's Memory Foam Pillow is proven to reduce pressure on your head and neck while providing the support you need for deep restorative sleep. When you combine the high density memory foam with all the other special features -- the butterfly shape, ear hollow, 40 degree neck elevation, bio magnets, and hypo-allergenic properties -- you have a very special pillow guaranteed to give you the sleep of your life. Who Needs the AiSleep Pillow? This pillow is fabulous. I had neck pain with tingling radiating down my arm . I was 100% better after a few weeks without the huge expenditure of time and money required for treatment by doctors or physical therapists. A few months later, and I'm still pain free and have no physical restrictions whatsoever. Better yet (at least for me), for long term use, it provides perfect support for your neck when sleeping on either side so long as you move to the proper position on the pillow. A night's sleep like I had last night is priceless! I was diagnosed years ago with a "military neck", that is, with no c-curve in my neck. It has caused a variety of problems with my head and upper back. I've tried every type of pillow I've come across in the last 10 years; some very good, some really awful. I slept on this pillow for the first time last night; I do not intend to look any further. I moved very slowly when I woke up this morning fully expecting some aches & soreness until I get used to my new pillow. There were none! I was in awe! My neck and upper back feel better today than they've felt in years. This is truly an amazing product. A night's sleep like I had last night is priceless! It's well worth the cost! 30 Night Trial... If You Don't Love It, Return It For Full Refund! © 2009 - 2013 AISleep.com. All Rights Reserved.